The Priory Church of Little Dunmow just off the Flitch Way has links with the legendary story of Maid Marian (of Robin Hood fame). 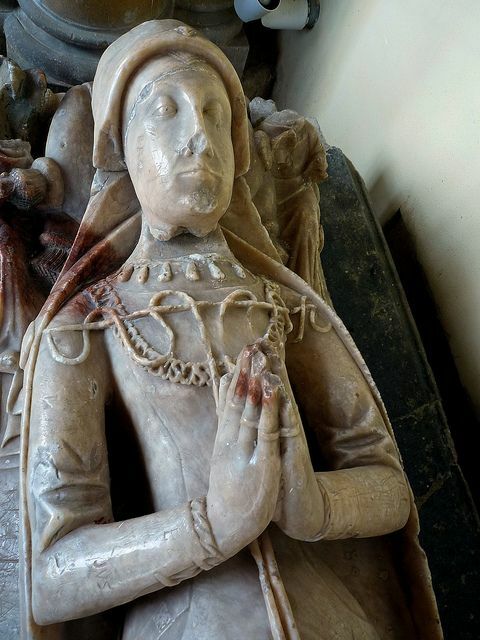 She was supposed to be murdered with a poisoned bracelet not long after her 18th year and now lies buried in the Priory Church of Little Dunmow just a few hundred metres from the Flitch Way. Matilda was the daughter of Robert, Baron Fitz-walter, proprietor of Castle Baynard, who is distinguished in English History, as the ‘Marshal of the Army of God, and Holy Church ;” and the leader of the illustrious barons, who extorted Magna Charta from King John. Upon her entering her eighteenth year, he invited the neighbouring nobles to a costly banquet. For three days, jousts and tourneys delighted the assembled guests, and won honour and lady’s love for many a new-made knight. On the fourth, a strange warrior, cased in mail, entered the lists, and vanquished the bravest of the combatants; his gallant bearing and handsome features enamoured the fair young queen of that high festival, and she blushed deeply when she hung the golden chain around the victor’s neck, and kissed his lofty fore head. His countenance was clouded with sorrow, and as he came so he departed, none knew whither. Prince John (afterwards king), who had honoured the castle with his presence, became smitten by the charms of the high-born maiden, and basely endeavoured to obtain her for a mistress. The Baron Fitz-walter, her father, treated his proposals with just and natural indignation, which so enraged the headstrong prince, that (taking advantage of his brother’s absence in Palestine, where the greater part of his followers were likewise fighting) he immediately attacked Castle Baynard, and slew its owner: but Matilda fled away to the green forest, and there, on the day following, was again met by the stranger knight; his burnished steel was laid aside, and he was clad in Lincoln green, the archer’s garb. He told the lady that he was Robin Hood, the outlawed Earl of Huntingdon and that he would shield her innocence from the fierce and cruel ravisher. The prince discovered her retreat, and attacked the foresters; a sanguinary fray ensued, during which it is said that John and the lady (who was then in male attire) met and fought. The prince required her to yield, and she resolutely desired him to win her first, and so stoutly did she repulse him, that he was constrained to withdraw from the ungallant contest. ​This part of the story places Matilda in a somewhat unfeminine light, but great allowances must be made for the customs of that age, and the peculiar circumstances of her case. She afterwards married Robin Hood, and when King Richard restored him his earldom and estates, she became Countess of Huntingdon : when her husband was again outlawed by King John, she shared his misfortunes, and, at his death, took refuge in Dunmow Priory (which appears to have been enriched by some members of her family), trusting to spend the residue of her days in peace. The tyrant, however, who had never forgotten her bravery in Sherwood Forest, dispatched a gallant knight, one Robert de Medewe, with a token to the fair recluse, — a poisoned bracelet. Ignorant of the accursed deed he went to perform, Sir Robert arrived at the priory, and was respectfully and cordially received. Matilda had lost the bloom and vivacity of youth, but her mien was stately, and her person still imposing. The rough warrior felt the flame of lore kindling in his bosom, but he strove to stifle it, and, bidding the lady a hasty adieu, speedily departed. Whilst on the road to London, his fond feelings waxed stronger and stronger the farther he proceeded from the object of them, and, at length, being unable any longer to curb his passion, he turned his horse’s head, and retraced his way. It was night when he reached the priory, but the light of many tapers streamed through the windows of the adjoining church on the weary soldier, and the solemn dirge of death awoke the slumbering echoes. With fearful forebodings he entered the house of prayer, and there in the chancel, on a bier and covered with flowers, was stretched the lifeless body of the unfortunate Matilda. The bracelet was on her wrist, it had eaten its way to the bone, and the fiery poison had dried her life blood. The flesh was ghastly pale, but a heavenly smile irradiated her fine countenance : the priests were standing around, weeping, and the disarray died away on their quivering lips when the warrior entered. He flung himself upon the lady’s corpse, invoking a thousand maledictions upon his own head. No persuasions could induce him to return to the camp and court, but, resigning his mail for the cowl and gown, he became a faithful brother of the order of St. Augustine. This story has been reprinted from one of her descendants Stephen Robert Kuta and you can find out more about his family history here.